I feel compelled to share with the few followers I have why I have been absent from the blogging scene for the past 13 months. I started blogging when my mind had enough serotonin, neuroephrine and dopamine neurotransmitters swirling around in my synapses to sustain a sense of normality, contentment and motivation. I was inspired by the creative novelty of developing a blog and felt compelled to write as part of my therapy. When i started blogging I had literally only read 2-3 blogs and was not active on social media so i had no idea where to start. I did brief market research and was inspired by the well executed blogs resemblance to published magazines and professional websites. From the outset i realised my blog didn’t fit any prototypes of recommended sites from marketing gurus for maximum exposure, popularity and mass following but I didn’t care. My blog started as a therapeutic tool where i could regain confidence and eventually produce critical pieces in preparation for going back to tertiary studies. In the beginning I placed more importance on my blog as ‘getting back on the horse’ with the thought of developing something more professional and marketing it later. Exposure isn’t something you seek when you are riding around a kids circuit on a Shetland Pony while the professional jockeys on Thoroughbreds masterfully gallop around the racecourse in the distance. So there i sat perched on a miniature horse with tufts of dreaded mane in my hand. From the racetrack i understood the look on the faces of Sydney’s society ladies, yes “how absurd” or “odd” to see a grown woman sitting on a kids horse uninterested in racing, what a “loser” some onlookers would murmur. While all admired the thoroughbreds luminous chestnut coats glistening in the sunlight. I was quite content riding off the beaten track like a child oblivious to the rules of the main race. I knew if I so desired I would be in the same races with comparable odds to excel. In my mind when I started writing i was happy to have finally made progress, any progress! After years overcoming trauma and mental illness, years stagnated and wasted. I was grateful to be alive and motivated to get back on a horse and to smell the racetrack once again. I knew i had to rebuild lost neural networks and self efficacy like a stroke patient requires physiotherapy to walk again. Depression and trauma had robbed me of myself and cast doubt over my ability to perform. My blogs succeeded in giving me the impetus to write again and so my journey began. Blogging for business didn’t interest me, i couldn’t produce anything for the sake of marketing or sales. I knew in the future if i wanted to continue blogging i would refine or start a new blog which would be branded, well-structured and executed as a not for profit. however at this stage i was trying to rebuild my life after trauma, disenfranchised loss, anxiety, depression and systemic discrimination. Therefore excellence or creating a perfect business model or blog in a competitive environment was a pressure I didn’t need at the time. So i started writing with only one thing on my mind: healing. I had experienced significant cognitive issues due to assaults, trauma and my diminished confidence from severe bullying. Research on bullying has revealed children who are bullied for an extended period of time experience significant trauma and psychological impairment equivalent to people who suffer from Post Traumatic Stress Disorder. In my life i experienced significant physical trauma resulting in lost cognitive function in areas of memory recall and identification. I am fortunate over the past 8 years i have regained most of the lost functionality, my brain has compensated or rebuilt neural networks and pathways allowing me to perform once again on cognitive tasks. In itself losing my ability to communicate freely and articulately due to an acquired brain injury is enough to kill the little confidence i had left. Overnight everything i had taken for granted in relation to my academic ability or intelligence was gone. I no longer had the ability to identify objects, places and things from category labels. I could not finish sentences as i scrambled to remember missing words, i was unable to recall words like “bank” or “kitchen” and found myself reluctant to engage out of fear of blurting out half finished sentences. I feared pursuing further tertiary studies because i knew i would not be able to perform in exams due to my impairment. My confidence dwindled and all i could think was “if only i hadn’t kept yelling out to God declaring my life would be easier if i were stupid” and now i was… what had i done! Years absent from formal studies and intellectual engagement didn’t help my confidence or ability to generate material efficiently and consistently. I understood I had to work hard building degraded neural pathways to reach what only ever could academically be a shadow of my old selfs peak performance, but I was fine with that and confident while I may not get HD’s or D’s I was still capable of achieving the C’s and maybe later D’s in a tertiary degree. blogging was from the beginning a therapeutic tool to regain my motivation and confidence in writing – anything – it didn’t matter – all that was important was regaining lost confidence, going back to uni and developing a pro-social blog to reach out to people suffering from mental illness and disabilities. So I started with a few experimental posts and enjoyed writing quick, spontaneous snippets about travel or art. Unfortunately after coping with years of stress and numerous oppressive factors I succumb to another relapse of clinical depression and disengaged from ALL pursuits aside from daily living and work. At work I focused on being grateful for what I had and tried to reflect a positive attitude, sometimes failing miserably with one older man commenting on how “pensive” I looked. However I somehow managed to pull it off and by ensuring my depression remained invisible and managed I retained employment while delivering appropriate service and duty of care. Retrospectively, I believe engagement in meaningful social activities and independence via paid work contributed to my recovery. Essentially I have been battling with a couple of relapses of reactive clinical depression and mild dysthymia. While I understand disclosure of my mental health issues will ultimately result in further covert discrimination by future and possible current employers – I risk further hardship and obstacles in pursuit of raising awareness and reaching out to others. One reason thousands of Australians commit suicide each year (on average 2500) is because the majority of people experiencing an episode of mental illness are experts at hiding it from employers and friends out of fear of judgement and loss of respect and perceived competency in their workplaces. People who suffer from mental illness often feel ashamed and attribute failure to themselves rather then seeing the illness as seperate and treatable. People who publicly disclose about their mental illness frequently become marginalised and excluded from equal employment due to the stigma surrounding mental illness and cultural acceptance of discrimination. Employers may covertly discriminate upon making inaccurate assumptions about a persons ‘competency’ or ‘ability to perform’ in certain roles due to their mental illness. What has made my experience easier to overcome is the fact I have hidden it away to avoid stigma, invisible from work colleagues and family, out of sight – out of mind right? Wrong! The beast that is depression lurks hidden away in the shadows, swimming in the undercurrents of your life, while you continue to picnic in the park beside the river where the beast resides. The picnic represents work and community engagement. I find when I relapse I can subdue the beast and keep IT hidden beneath the water until I get home when I can let IT out to run amok, behind closed doors, unseen and hidden from the public. I have found from past experience it is more effective to lie about my mental illness and take time off from work with physical ailments rather then face prejudice or discrimination. The beast that is depression remains submerged, hidden away from ignorant minds and heartless souls, surfacing only to see the psychologist. The beast to the knowing eye is an innocuous, loving and gentle human. Unfortunately our western society and culture has demonised normal human emotional reactions and effectively turned mental illness into something to be feared. So on days when I am unwell I tame my beast and submerge IT beneath the water of my consciousness. Subliminal hell now my default choice after earlier years spent fighting stigma and ignorance. I realised it is wiser to limit any disclosure about my mental illness to therapy sessions with my psychologist or counsellor. Past attempts to disclose about my depression resulted in discrimination, exclusion, ridicule, denial, and loss of status or respectability in relationships. I have spent my adult life overcoming depression, coping strategies i acquired from experience have been effective and sadly may be necessary. Mental illness is not respected in our social networks or work places. People known as mentally ill are in reality likely to face discrimination. From my experience with a mood disorder I grapple with the difficult paradox or contradiction: to be functional and in a good mood some of the time only to be struck down the next day by the freak storm of another episode. Due to the invisibility of my experience with mental illness onlookers see only a fully functional woman and dismiss the presence of any illness which years ago was my desired outcome. I wanted to hide my stigmatised illness away to avoid discrimination and marginalisation. Perhaps I have become too skilful in hiding my depression! In denying or repressing the beast in order to live – to cope – to survive. I have experienced two different types of mood disorders. My first experience is categorised as major clinical depression which lasts anywhere from two weeks to months. 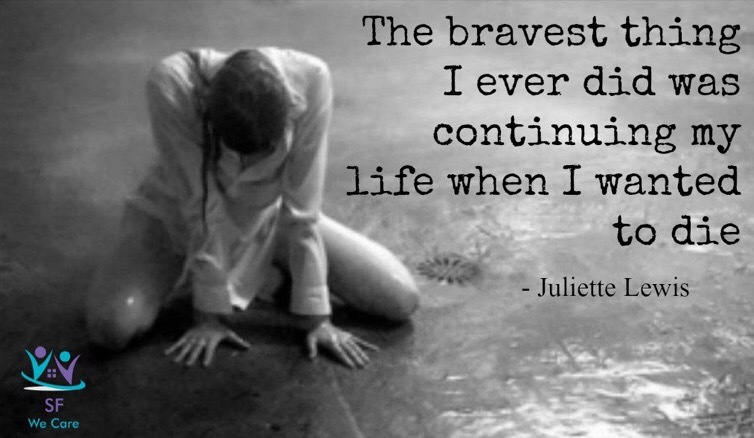 When i was first struck down with depression as a teenager months became years. Recovery was met by intermittent relapses and debilitating episodes that disrupted studies and destroyed relationships as ignorant friends judged and distanced themselves from me. During an episode i exhibit symptoms such as: apathy, diminished motivation, insomnia or excessive sleeping and inability to get out of bed, lethargy, frequent crying, feeling hopeless, diminished confidence, indecisiveness, memory loss, anxiety, physical exhaustion (muscle fatigue and a heaviness), and lost interest or pleasure in all activities (such as academic studies, work related training and assessments, business, reading, blogs, social engagement, eating, cooking, art and sport). My second experiences are of dysthymia which is an ongoing low level mood and occasional intense mood swing lasting one day, however mimicking an episode of depression. It is difficult to adequately communicate how frustrating and utterly confusing it is to be happy one day and severely depressed the next morning. To feel all the symptoms of a major episode of clinical depression in one day with no obvious trigger or reason. Over the past year i had one minor episode of depression, a few weeks in-between of noticeable dysthymia and at least two days where i was struck down by an anomalous depressive mood swing (most occur the day before my menstrual cycle begins and possibly caused by hormonal changes during this period). Recently i was frustrated by my inability to prevent the relapse and similarly to overcome the illness. I had unrealistic expectations of myself from past success treating depression without medication and developing the resilience i thought would safeguard me from having another breakdown. I wanted to force myself back to the gym and engage in courses for work. However my attempts to convince myself to exercise or complete work during this time failed. Such is the nature of a mood disorder – the nature of the beast – when it sets in it is there to stay and you can’t just “snap out of it” or “think positive thoughts and stop being so negative!” or exercise when your body feels heavy and you are about to burst into tears. To be fair I did take time off from work in 2015 when my experience of minor depression peaked in severity. At my lowest points I can not get out of bed and find myself crying throughout the day. I would diagnose my 2015 relapse as an episode of minor clinical depression with extended periods of mild dysthymia. I am relieved my recent experiences were minor and i managed to overcome it all without medication. During my relapse Friends dismiss me as “anti-social” as though I purposely cancel events and don’t want to see them! If I was lying in bed after a chemotherapy treatment for cancer I am certain the same “friends” would not accuse me of making “bad choices” or not investing enough into the relationships for failing to catch up for dinner or go to an event! Unfortunately mental illnesses are invisible and considered as less of a medical health concern compared to medical illnesses. Therefore friends and associates often dismiss the existence of a disorder and attribute symptoms to a persons character such as: “she is not depressed! she is just lazy or not working hard enough”. Similarly, mental illness is frequently perceived as the persons “choice” and therefore people are blamed and held accountable for being mentally unwell rather then supported with the same empathy one would give someone with a medical health problem. I have just started to function normally again. It has been hell although I am proud I have maintained employment and my health. My employment has been an integral part of the recovery process. Employment and meaningful engagement in our lives gives us purpose and structure. I have to stress that I have “reactive” depression which is an enfliction caused by crippling social-environmental factors and not biological. While I have an underlying biological pre-disposition I would argue without the harsh environmental factors I would never have experienced depression at all. But who cares whether the chicken or egg came first! Depression in all its forms is the same medical illness and all who suffer from depression are enflicted with the same excruciating emotional torment and loss. Loss of functionality, loss of employment, loss of relationships, loss of meaning, loss of productivity, loss of achievement, loss of life, loss of joy, loss of time! We all grieve together. A Disenfranchised grief due to the invisibility of depression and invalidation by many within our social networks and society. The irony. The casualization of the Australian labour market has subsequently been one factor in my recent depression. I have two casual jobs and have been working with unpredictability and other factors people would never tolerate in a normal 9-5 corporate position. I have been financially strained and struggling to support myself week to week. I am not going to sugar coat anything or sell myself falsely to gain popularity or future employment. It is what it is and it sux! My employers may read this and ironically give me less work which is one of the factors that lead to my depression in the first place. I won’t go into detail about the other environmental and social factors which have pressurised my life and made dealing with depression more difficult. This post is a brief message to anyone reading my blog that I am still here! I just needed time out due to yes another relapse! So I apologise to anyone who has sent emails or tried to share their stories or comments on here as I have been M.I.A. I will expand the topic of this post and highlight depression on this blog in the New Year. If anyone is interested in sharing their stories or experiences with a mental illness or disability please email me and I will post your story on my blog – submit via my website or email. I would love to hear from you! The more we all talk openly about our experiences with mental illness the closer we get to reducing the stigma and educating people about mental illness.